This is a list of whisky brands arranged by country of origin and style. 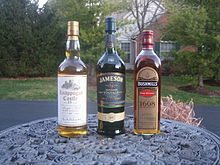 Whisky (or whiskey) is a type of distilled alcoholic beverage made from fermented grain mash. Different grains are used for different varieties, including barley, malted barley, rye, malted rye, wheat, and corn. Whisky is typically aged in wooden casks, made generally of charred white oak. 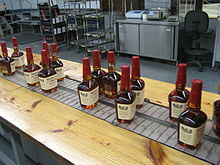 Thirteen large distilleries owned by eight companies produce over 99% of the whiskey made in the U.S.
Of the thirteen, ten are in Kentucky, two are in Tennessee, and one is in Indiana. The three states are grouped together in the east-central mainland region of the United States. Brands are listed alphabetically by brand ownership and the name and location of the distillery. The brand owner is included if different. 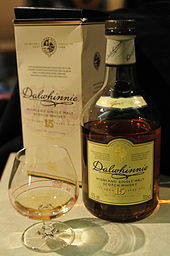 Australia produces a number of single malt whiskies. Tasmanian whiskies in particular were the first to receive global attention. Australian whiskies are winning an increasing number of global whisky awards and medals, including for example in the World Whiskies Awards and Jim Murray's Whisky Bible 'Liquid Gold Awards'.. Mainland Australian whiskies are also obtaining global recognition, in particular a West Australian whisky. Samuel Smith & Son (Smith's Angaston Whisky). 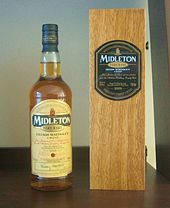 ^ Oxford English Dictionary, Second Edition: "In modern trade usage, Scotch whisky and Irish whiskey are thus distinguished in spelling; whisky is the usual spelling in Britain and whiskey that in the U.S."
^ Albala, Ken, ed. (2015). The SAGE Encyclopedia of Food Issues. SAGE Publications. ^ Crumbie, Trey (January 26, 2017). "'Super-premium' Kentucky Owl bourbon bought, to be available nationally". Lexington Herald-Leader. Lexington, Kentucky. Retrieved December 4, 2017. ^ Patton, Janet (January 26, 2017). 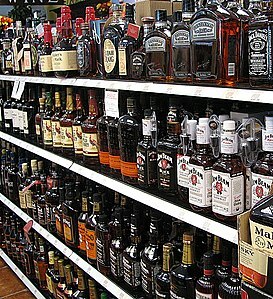 "New lakeside bourbon complex will cost $150 million. See what it will include". Lexington Herald-Leader. Lexington, Kentucky. Retrieved December 4, 2017. ^ a b Olmsted, Larry (May 19, 2015). "A Bold New Rye Whisky From Canada's Rye Expert". Forbes Magazine. Retrieved November 20, 2015. ^ "Homepage » Dad's Hat Rye". Dad's Hat Rye. ^ "George Washington's Mount Vernon Distillery & Gristmill". Mount Vernon Ladies' Association. Retrieved 21 October 2013. ^ "Our Spirits Offerings – Tuthilltown Spirits". Tuthilltown Spirits. ^ a b c [http://montanawhiskey.com/ Rich Grain Corn Whiskey Rich Grain Distillery, Canton Mississippi RoughStock Distillery] official website. ^ Blue Ridge Distilling official website. ^ "Swift Single Malt". Swift Whiskey. ^ Westland Distillery official website. ^ TOPO Distillery official website. ^ Colquhoun, Steve (21 March 2014). "Tassie whisky named world's best single malt". The Sydney Morning Herald. Retrieved 23 March 2014. ^ "Tasmania Distillery's Sullivans Cove takes world whisky title for single malt". Australian Broadcasting Corporation. 21 March 2014. Retrieved 23 March 2014. ^ Brammer, Jenna (6 April 2017). "WA Drop named 'Best International Whisky in the World'". West Australian Newspaper. Retrieved 18 January 2018. ^ Adsti, Saskia (2 November 2017). "Peat the Secret to Winning Drop". West Australian Newspaper. Retrieved 18 January 2018. ^ "Australian whisky distilleries". Archived from the original on October 7, 2012. Retrieved June 30, 2015. ^ "Closed Australian whisky distilleries". Archived from the original on September 7, 2012. Retrieved June 30, 2015. ^ "Officer's Choice, McDowell's No1, Celebration, Honey Bee and Old Tavern top global liquor chart". timesofindia-economictimes. ^ a b c d "The History of New Zealand Whisky", New Zealand Whisky Company website. Retrieved 11 April 2014. ^ "Craigellachie – Scotch malt whisky distillery profile". maltmadness.com. 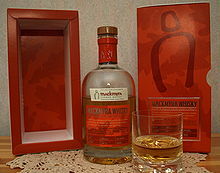 Wikimedia Commons has media related to Whisky by brand.